RPS balcony hinges manufactured by R-Group Finland Oy are steel parts used in pre-cast concrete buildings to transfer horizontal loads from balcony slab to the building ﬂoor and at the same time allowing vertical momevent of balcony due to temperature changes. RPS balcony hinge consists of R30 or R36 lifting anchor installed to the balcony slab before casting and balcony hinge steel part installed to the ﬂoor grouting. These parts are connected with an attachment screw. 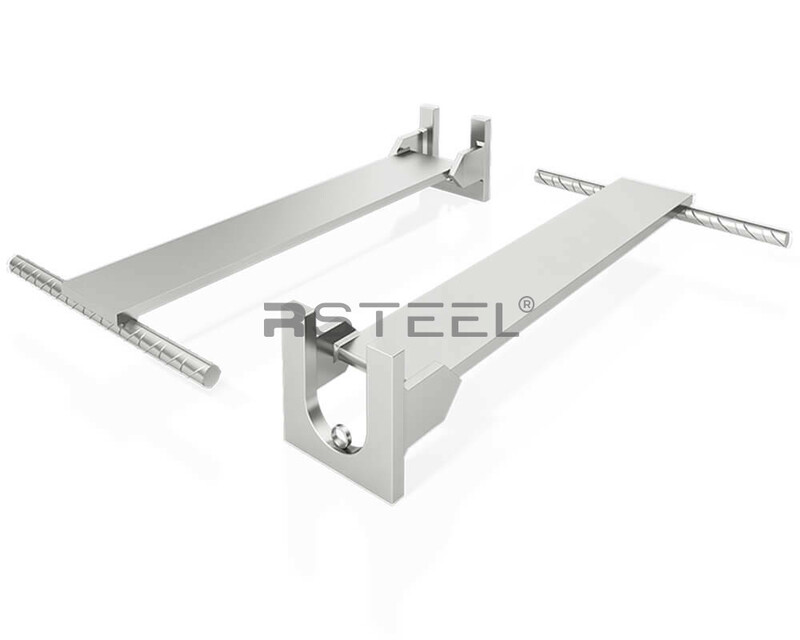 The way of connection is different from those of other balcony hinges,there is a connecting plate open of its lower edge, whereby the installation from top down is easy and can be performed without tools. The connecting sections include a connecting screw fastenable to the connecting anchor and between them an elevating sleeve by means of which the distance of the connecting screw from the connecting anchor is adjusted. An adjusting ring is installed in the connecting plate and the adjusting ring is arranged to adjust the correct position of the steel section in the installation stage. In the first phase the attachment screw is screwed ro the R lifting anchor through the rising socket and tightened securely. Attachment screw is locked by damaging the thread before assembly (done at the factory). In the second phase the U-shaped attachment plate is placed over the rising socket, behind the attachment screw.